Porsche 911 GT3 Performance, Engine, Ride, Handling | What Car? You notice that racing car derivation the instant the engine catches. It settles into a lumpy idle, churning slight vibrations through your spine that, under normal circumstances (when reporting on hatchbacks and the like), we’d chastise. But in something so special and intentionally raw as the 911 GT3, with its performance theme front and centre stage, this merely becomes added drama that immerses you deeper within the scene. And in the world of supercars there’s something very special about the 911 GT3’s engine. It’s a flat-six, for a start – something that’s unique to Porsche. But, unlike the rest of the 911 range (and every supercar bar one or two exceptions, such as the Lamborghini Huracán and Audi R8), the GT3's engine is naturally aspirated, not turbocharged. If you grew up in the 1970s and 80s under the impression that if something wasn’t turbocharged it was bunkum, even your Hoover, then think again. 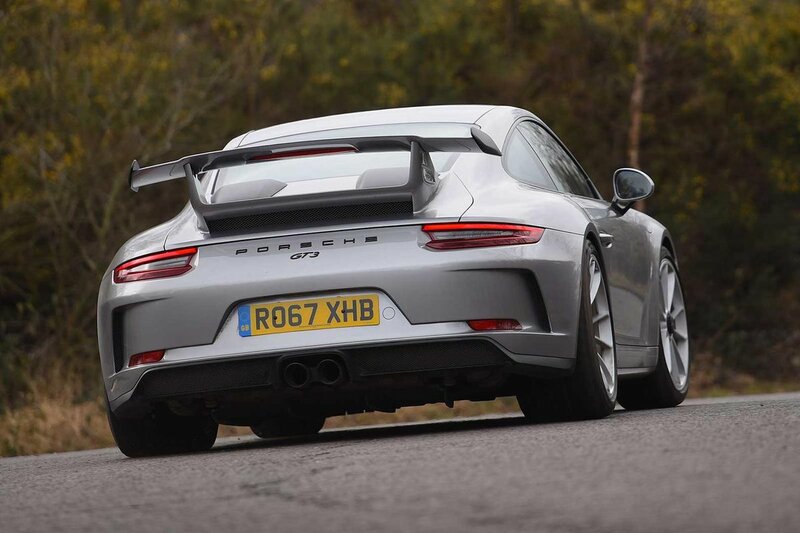 Because the GT3’s 493bhp 4.0-litre engine doesn’t have a turbocharger, it responds instantly when you press the accelerator pedal, with no lag while you wait for a turbo to spin up and provide added thrust. And it revs freer and higher, too – 9000rpm, to be precise. That’s worth repeating: yes, nine thousand revolutions per minute. Very few road cars can lay claim to a more advanced spin cycle but, as we know, the 911 GT3 is part-racing car and this engine was designed for the track. How does it translate to the road? Well, it lacks the low-end surge of a turbocharged McLaren 540C on boost, yet still produces enough torque to get a shift on from 3000rpm. But that immediate response is such a delight in this era of turbocharging, so as the revs rise and the power really starts building from 5000rpm, every millimetre of travel you input to the loud pedal correlates to an interpretable increase in thrust. Such accelerative linearity is almost telepathic and far easier to read, and therefore to meter, than the elasticated responses of a turbocharged car – something to appreciate when there’s this much power available. Once it’s in its power band, it is fast. Supercar fast. The all-consuming kind that acts physically, by pushing your torso back in the seat, and on the senses, as your brain tries to keep up with the sheer volume of information pouring in. And it’s relentless, because this is the PDK dual-clutch automatic version, which fires you seamlessly from gear to gear prolonging the accelerative assault. 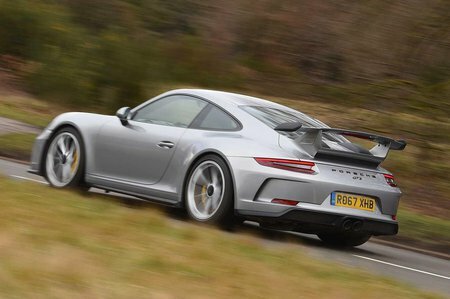 On which note, purists looking for the ultimate interactive driving experience can rejoice that the GT3 is also available with a manual gearbox. But don’t dismiss the PDK without a thought; it is so good and the GT3 experience so engrossing anyway that it definitely warrants consideration. Yet it’s the noise that this divine engine makes that is most striking. It’s your typical flat-six fandango with added mania; kind of demonic yet delectable, filled with the screams from whizzing camshafts, furiously fluttering valves and pistons pinging back and forth at incomprehensible speeds, as you tick past 7000, 8000, then hit the magic 9000rpm. It is probably the best-sounding engine currently on sale, the only debate being whether that intoxicating V10 in the R8 and Huracán sound any more tuneful. At first it’s overwhelming; you listen in disbelief as the revs keep going higher and higher and higher, thinking: “Surely this is gonna go pop?” But once the discombobulating subsides, if your heartstrings are even vaguely prone to the tug of automotive majesty, you simply end up smiling - so hard that your cheeks tingle. Speaking of tingling, that’s what the Alcantara steering wheel does to your hands. Even in a straight line, it chatters away like a couple of gossiping grannies, streaming little messages about the road’s surface for you to interpret. Turn in to a corner and it weights up impeccably, letting you gauge the stress on every molecule of rubber in those fat, sticky Michelin Pilot Sport Cup 2 tyres and what grip they have left. Which is usually plenty, as long as you have some heat in them; if the ambient temperature is hovering anywhere near zero they stop working, to the point you'd struggle to outrun a badly driven Lada Riva shod with dodgy old remoulds. Rest assured, though, that when the tyres are gripping the 911 GT3 could keep pace with pretty much anything – the 540C and R8 included. It may not have four-wheel drive like the R8, but the weight of that engine over the rear tyres presses them down hard into the asphalt as you accelerate, so the traction out of corners is extraordinary. Even in the wet, while you need to be prudent and respectful of the power, the 911 GT3 is surprisingly docile. That’s on the way out of corners; but it’s controlled through them, too, with an inherent precision and adjustability that is not just exploitable but wholly enjoyable, even at sensible road speeds. Part of that is down to the suspension set-up. It’s adjustable in the old-fashioned sense - you can crack out the spanners and tinker with the geometry to tailor it for the track - and also in the modern way, with a button to vary the dampers’ stiffness. Even using the off-the-shelf settings, with the dampers in their soft mode, the 911 GT3 displays sublime body control, flowing along even bumpy UK roads with the ease of mountain stream over jagged rocks. So, again, despite its on-track potential, this is a car that really works on our roads. It even rides relatively well. Sure, it’s firm and follows every surface undulation intently; yet there’s also this delightful suppleness within, which makes it so amazingly forgiving over the sharp-edged scars that if you chose to, you could use it everyday. And if you did, unlike most supercars you won’t feel the cold sweat of fear form on your brow at the glimpse of a distant speed bump. Even without the optional nose-lift feature fitted, the 911 GT3 is able to climb sleeping policemen and descend those relatively steep ramps from petrol station forecourts without graunching. Did we mention the brakes? No? Well, these are also confidence-inspiring. We tested a car with optional carbon ceramic brakes and, from the moment you begin to squeeze the pedal, you know they’re going to stop you smoothly as well as rapidly. As with everything about the 911 GT3, they’re part of this perfectly engineered package that’s designed to be intuitive; keeping your mind focused purely on the act of driving, without the distraction of real-time thinking on how to go about it. 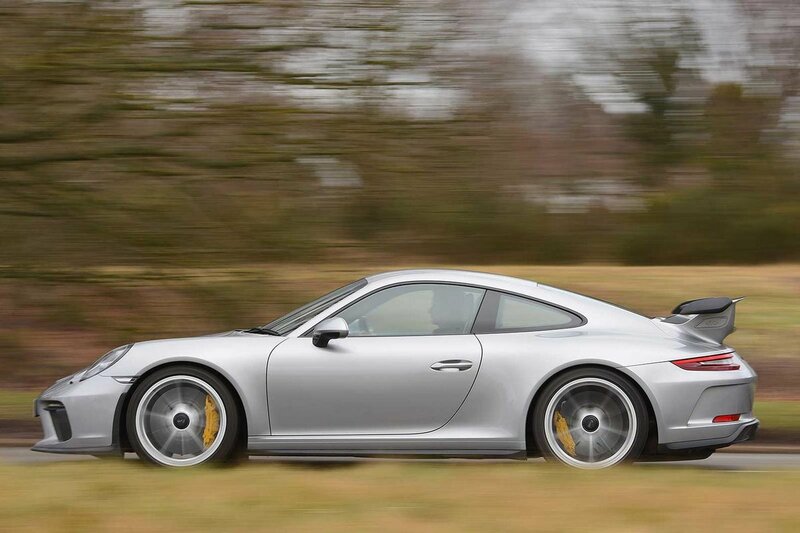 Is there anything bad about the 911 GT3? Hmm… yes, there’s a lot of road noise at 70mph. But since that’s a problem with all 911s and this is one of the most focused cars you can buy, is that an issue? No, not really.